Yakov Smirnoff, the Soviet-born American Jewish comedian, actor and writer, was a big name on the comedy circuit after emigrating to the United States in 1977. When he was born in Odessa, the Ukraine, in 1951, it was still part of the Soviet Union. He reached the height of his success in the mid-to-late 1980s, when he also appeared in several films and television shows, including his own 1986-87 sitcom, What a Country!. His comic persona was of a naive immigrant from the Soviet Union who was perpetually confused and delighted about life in the United States. His humor combined a mockery of life under Communism and of consumerism in the United States, as well as word play caused by misunderstanding of American phrases and culture, all punctuated by the catchphrase, "And I thought, 'What a country!'" 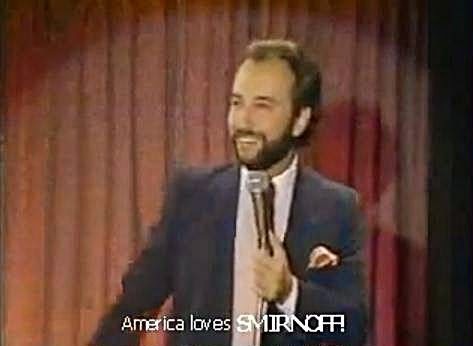 The collapse of Communism starting in 1989, and especially the fall of the Soviet Union in 1991, brought an end to Smirnoff's widespread popularity, although he continued to perform. In 1992, he bought his own theater in Branson, Missouri, where he still performs and hosts. In the late 1990s, prompted by his own divorce, he retooled his stand-up act to focus on the differences between men and women, and on solving problems within relationships. Smirnoff is also a professor at Missouri State University and Drury University where he teaches "The Business of Laughter." We happened to come across Smirnoff's classic stand-up routine while surfing the waves of comedy on the Internet, and, laughing out loud, just had to share it with you. This act was performed at Dangerfied's in New York, with Rodney introducing him.